Bill Robertson Toyota is pleased to announce a very special campaign to help Gladstone families in need this Christmas. Starting December, 1 for every new or used vehicle retailed at the dealership, Bill Robertson Toyota will donate to the UnitingCare Queensland Gladstone Christmas Appeal. 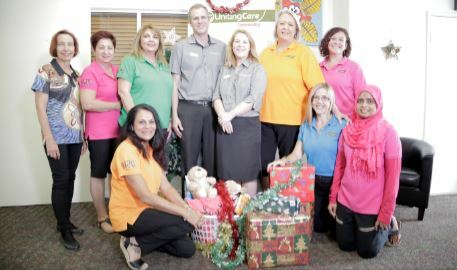 UnitingCare Queensland’s Gladstone office supports local families in need. The organisation has a number of important programs in place including their Intensive Family Support Service to help families feel safe and connected to the right services at the right time. UnitingCare Queensland Gladstone currently supports around 60 local families. In the lead-up to Christmas and the month after this number can rise. Gladstone UnitingCare Queensland’s Christmas Appeal enables it to supply and deliver much needed Christmas gift hampers to local families in need. The hampers will be filled with toys for children and non-perishable foods to bring a little Christmas joy. This is where local Toyota Dealer, Bill Robertson Toyota, decided to help. For every vehicle sold, new or used, at Bill Robertson Toyota from December 1 – 24, Bill Robertson Toyota will donate $100 in their guest’s name, to the UnitingCare Queensland Gladstone Christmas Appeal. The dealership is confident the total donation from the campaign will be more than $2,000. Bill Robertson Toyota Dealer Principal, James Robertson said, “There’s a lot of Gladstone families doing it tough at the moment. We usually have a Christmas promotion but this year we thought our Guests would probably be happier to know they were helping another local then they would be receiving a small gift from us. UnitingCare Queensland had already approached us about helping with their Christmas Appeal so it was a great opportunity to put the two activities together.